Star India’s Malayalam Entertainment Channel, Asianet has successfully completed 25yrs of operation and the channel has celebrated the occasion with a special start night in presence of prominent celebrities across South India. we have posted about the event Asianet @ 25, which happened last sunday, 2nd December 2018 at FACT Sports Association Ground. Asianet is the malayalam gec leader, ruling kerala trp ratings charts. crossing 1000 more points every week. Ulaganathan Kamala Hasan, Mohanlal, Mamooty, Mukesh, Jayaram, Jagadish, Manianpillai Raju, KPAC Lalitha, Manoj K Jayan , Vineeth , Mamukkoya Malavika Menon, Aiswarya Devan , Asianet MD MR. K Madhavan were some of the celebrities present during the 25th year celebartion evening. Onnanu Nammal is an upcoming event conducted by Asianet & Malayalam Movie Artistes (AMMA). 7th December 2018 at Armed Forces Officers Club, Abu Dhabi is the date and venue for Onnanu Nammal Show Mega Show. The amount raised from this show will be utilized for rebuilding Kerala. Famous filmstars like Shobana, Padmapriya, Lakshmi Gopalaswami, Asha Sharath, Miya, Anusithaara, Iniya, Shamna Khasim, Joemol, Divya Unni, Meera Nandan , Nair sisters (Veena, Dhanya) performed with other styles of dance like Manipuri and Odissi, were also staged under the leadership of Soorya Krishnamoorthy. 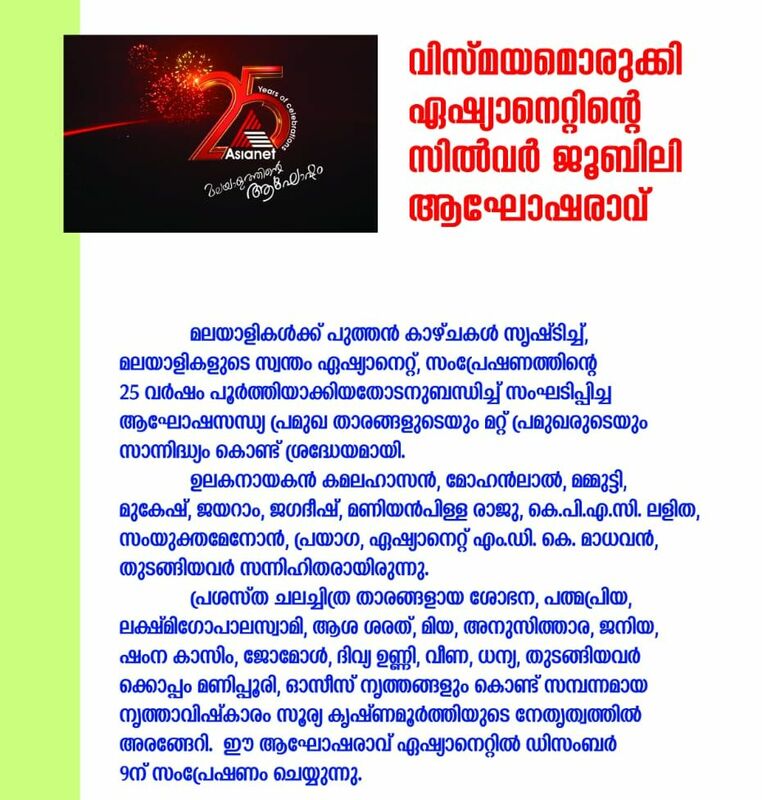 The televised event of Silver Jubilee Celebrations will be aired in Asianet on 9th of December. After the original telecast it will be available through hotstar application.